Ponte Vedra Beach Preserve new community. 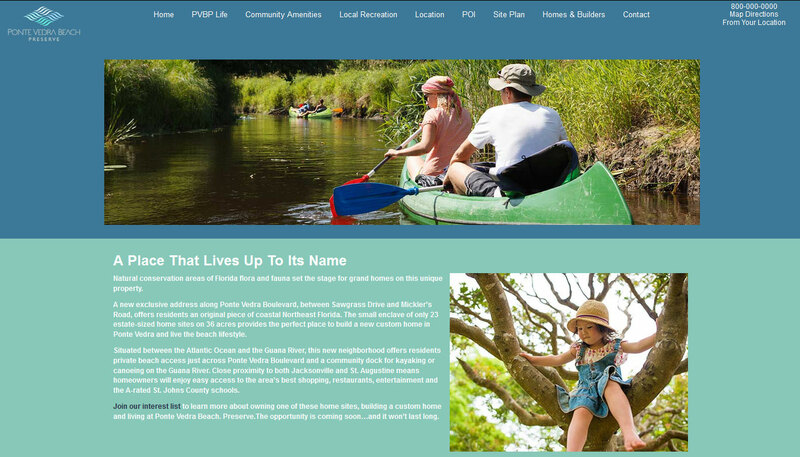 DESCRIPTION: A Place That Lives Up To Its Name – Ponte Vedra Beach Preserve – your community, your life, your home. Natural conservation areas of Florida flora and fauna set the stage for grand homes on this unique property. A new exclusive address along Ponte Vedra Boulevard, between Sawgrass Drive and Mickler’s Road, offers residents an original piece of coastal Northeast Florida. The small enclave of only 23 estate-sized home sites on 36 acres provides the perfect place to build a new custom home in Ponte Vedra and live the beach lifestyle. Situated between the Atlantic Ocean and the Guana River, this new neighborhood offers residents private beach access just across Ponte Vedra Boulevard and a community dock for kayaking or canoeing on the Guana River. Close proximity to both Jacksonville and St. Augustine means homeowners will enjoy easy access to the area’s best shopping, restaurants, entertainment and the A-rated St. Johns County schools. Join our interest list to learn more about owning one of these home sites, building a custom home and living at Ponte Vedra Beach. Preserve. The opportunity is coming soon…and it won’t last long.